The ash cloud from the Icelandic volcano has caused disruption to flights again, with the Irish Aviation Authority restricting airspace for most of today. 22.30 Ryanair has cancelled four flights tomorrow into and out of Shannon and Kerry airports. It expects all flights to operate as normal from Dublin, Cork and Knock, as well as airports in the UK. Dublin, Waterford, Donegal and Cork (4am). Shannon, Galway and Knock (8am). Kerry (9am). 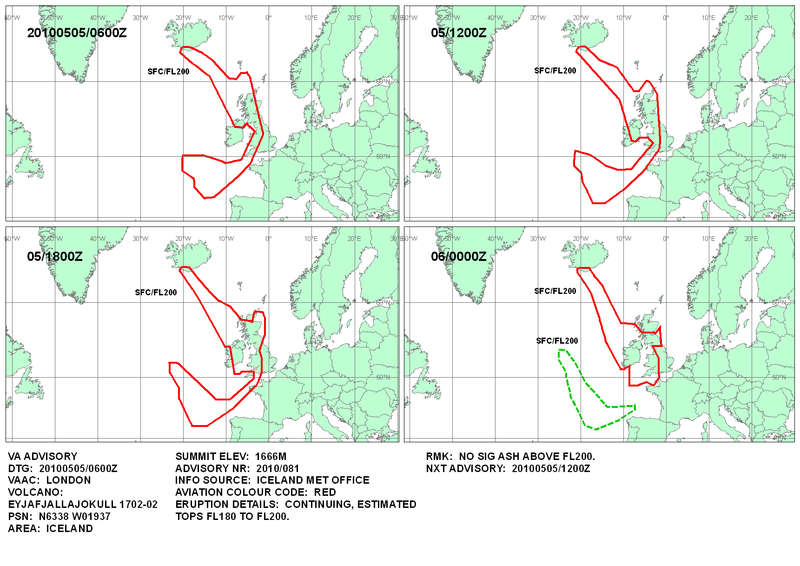 The IAA said the ash cloud is moving southwestwards and airport restrictions will be lifted according to its progress. 18.15 Aer Lingus have confirmed their plans for tomorrow. The following flights are scheduled to arrive at Dublin Airport tomorrow: EI 104 New York to Dublin, EI 132 from Boston to Dublin and EI 110 New York to Dublin. Aer Lingus will deploy extra capacity on the following routes to and from Dublin: Faro, Bourgas, Krakow, Malaga and Warsaw. 18.11 Celtic Link Ferries have reminded travelers that they have a service operating between Rosslare and Cherbourg that allows for foot passengers and car passengers. Services run every Tuesday, Thursday and Saturday ex. Rosslare and every Wednesday, Friday and Sunday ex. Cherbourg. 17.59 Scandinavian Airlines has arranged a bus to bring its passengers from Dublin Airport to London this evening. The bus departs at 7pm and arrives in Heathrow at 6am tomorrow. 17.30 Cork Airport will be closed to all inbound and outbound aircraft from midnight tonight until 11am tomorrow. 17.06 All Ryanair flights to/from Belfast, Derry, Edinburgh and Glasgow Prestwick until at least midnight have been cancelled. • No disruption at UK airports. • Flights to/from Dublin and Knock to operate on schedule. • All flights to/from Shannon cancelled until 1400hrs. • All flights to/from Kerry cancelled until 1600hrs. 17.00 Aer Lingus has confirmed that it plans to operate its full transatlantic schedule from Ireland to the US tomorrow. All departing and arriving flights into Dublin and Belfast airports have been cancelled for the remainder of today. 16.45 Irish Ferries has said that there are places available on its Dublin-Holyhead and Rosslare-Pembroke sailings, as well as its services between Ireland and France. 16.25 Due to the continuing disruption of flights as a result of airspace restrictions in Ireland, Aircoach has amended its services for today. 16.20 The head of the Aviation Services with Met Éireann, Dave Murphy, said the situation may improve tomorrow. 15.55: At present all Irish airports with the exception of Shannon, Cork and Kerry are restricted due to the presence of dense volcanic ash over Ireland. Shannon, although currently operational, will be restricted from 5.30pm. Cork and Kerry are operational until midnight, when restrictions will apply. The IAA will issue a statement confirming these times at 8.30pm, following the receipt of updated volcanic ash data. Overflights of Irish airspace between North America and Europe will continue as normal. 15.51 Britain's official weather forecaster, the Met Office, said predictions indicate that the ash will remain over much of Ireland, Scotland and western England into Thursday and would continue to move south. 15.10 The Minister for Transport has told the Dáil that the Government is not in a position to provide aid or compensation for the aviation industry. Minister Noel Dempsey also said the volcanic ash problem was costing Aer Lingus an estimated €5m a day and Ryanair about €6m a day. 14.55 City Jet have been forced to cancel many of their flights for today and tomorrow. Information on the cancellations here. 14.25 The National Chamber Choir have been forced to cancel tonight’s concert ‘To Music’ at St Mary’s Cathedral in Limerick as the artistic director is stranded in Copenhagen. Tomorrow’s performance at the National Gallery in Dublin will go ahead with conductor Fergal Caulfield replacing Paul Hillier. -Dublin Airport will be restricted until midnight. -Shannon Airport will be open until 17.30. -Cork Airport will be open until at least midnight. -Kerry Airport will be open until at least midnight. -Waterford Airport will be open until at least 15.00. -Galway will be restricted from 12.00. -Ireland West (Knock) will be restricted until at least midnight. -Donegal Airport will have restrictions in place at least until midnight. -Sligo Airport will have restrictions in place at least until midnight. 13.23 Britain's Civil Aviation Authority (CAA) has said the no-fly zone would extend from 1pm today to include Belfast City, Belfast International, Ronaldsway (Isle of Man) and Edinburgh airports. 12.40 Shannon Airport will remain open for flight operations until 5.30pm this evening. 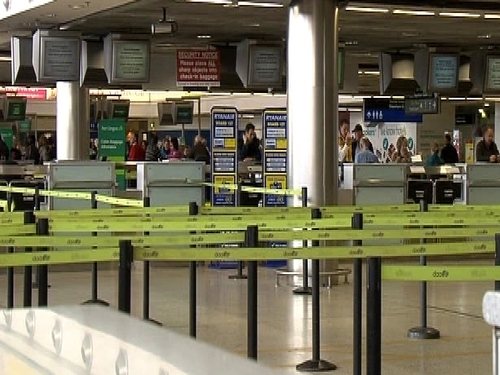 Airport authorities say they are accepting flights that have been diverted to them which cannot land at Dublin, including two Ryanair flights from Wroclaw in Poland and Treviso in Italy, and a number of Aer Lingus flights from Lisbon, Brussels and London Heathrow. Passengers on these flights will be taken to Dublin by bus. Flights after 5.30pm up to midnight have been cancelled. 12.15 Bus Éireann has put in place additional coaches for its 7.30pm Eurolines Dublin – London service this evening. The service uses the ferry and arrives in London city centre (Victoria Coach Station) at 8.30am tomorrow. There is also a service at 19.15 this evening from Busáras to Liverpool-Manchester-Leeds. Customers are advised to purchase their tickets online at www.buseireann.ie. 11.53 A spokesperson for Cork Airport has confirmed that the airport will be open until at least midnight. However, they stress that passengers should continue to contact their airline websites to establish the up-to-date position on flight schedules before travelling to the airport. 11.51 Flybe has cancelled all today's flights to and from Belfast City and to and from Glasgow. Flybe has also axed a number of other services, including some flights from Manchester, Liverpool, Luton and Cardiff. 11.48 Ryanair has cancelled all flights today to and from Belfast, Derry, Edinburgh and Prestwick airports, saying it had been told that the four airports would be closed until at least midnight. 11.42 Five Dublin bound flights have been diverted to Cork Airport, with the first due to arrive at 12.45pm. An Aer Lingus flight from Brussels which had been expected to land in Cork at 12.10 has now been diverted to Shannon. Three Ryanair and two Aer Lingus flights have been diverted from Dublin to Cork - Aer Lingus flights from Frankfurt and Barcelona are due in within the next hour as are three Ryanair flights from Rome, Bratislava and Poznan. Buses are expected to be on standby to take passengers to Dublin Airport. 11.28 Fastnet Line, the operators of the Cork to Swansea ferry, says it is dealing with increased bookings for tonights sailing at 9pm. They have already had 80 additional bookings this morning. 11.20 Irish Ferries says it is experiencing an increase in calls and bookings. It says the remaining spaces for walk-on passengers on their fast ferry sailing from Dublin port to Holyhead at 2.30pm filled quickly. There is some space for motorists on this ship. 11.15 The Dublin Airport Authority says passengers are advised not to come to the Airport during those times and to contact their airline or airline's website. 11.13 Ryanair says all its flights to and from Dublin and Knock airports from 11.00 until midnight have been cancelled. 11.00 Dublin airport is now closed. 10.54 Stena Line says it received at least 200 extra bookings last night, and is dealing with extra ongoing enquiries arising from the latest volcanic ash related aviation problems. Eamonn Hewitt of Stena said the latest increases comes on top of an ongoing 100% increase in business for the time of year since problems with volcanic ash first developed in mid-April. 10.02 A spokesperson for the Department of Transport said there is no immediate plan to reconvene the Government Taskforce on Emergency Planning. He said the volcanic ash situation is being monitored. 10.00 The Irish Aviation Authority says restrictions will operate at Shannon Airport from 17.30 until midnight. 09.46 All Ryanair flights to and from Dublin and Knock from 11.00 until midnight have been cancelled. Flights at Cork, Kerry and Shannon are operating to schedule, with previous restrictions lifted. 09.45 Aer Lingus says flights scheduled to depart and arrive into Glasgow and Edinburgh from Dublin and Cork have been cancelled up to 13.00 tomorrow. All of the airline's flights to and from Belfast International Airport to Britain and Europe up to 13.00 have also been cancelled. -Dublin Airport will be restricted from 11.00 until midnight. -Waterford Airport will be open until at least 19.00. -Ireland West (Knock) will be restricted from 11.00 that will last at least until midnight. 09.25 The IAA says that since 16.30 yesterday the volcano in Iceland has expelled denser, coarser ash higher into the atmosphere. 09.20 The Irish Aviation Authority has announced that Dublin Airport will be closed from 11.00am until at least midnight. In a statement it says Donegal, Sligo and Knock airports will also be closed until midnight. The IAA says Shannon airport will be open until 5.30pm, Cork and Kerry airports will be open until midnight, while Waterford airport will be open until at least 7pm. The Authority will issue a statement at 4pm. 09.13 Shannon Airport has not been affected by restrictions and flights are proceeding as normal. The airport authority is in touch with the IAA about whether there may be any changes to that later in the day but for the moment it is business as usual at Shannon. 09.02 Northern Ireland's two main airports, Belfast International at Aldergrove and George Best Belfast City Airport are both remaining open until 1pm. Management says the flight situation is 'fluid' and some flights are arriving and departing. At the moment, both airports are scheduled to close from 1pm until 7pm today. The airline said additional cancellations are possible pending further updates from the Irish Aviation Authority later this morning. It is advising passengers to monitor the airline's website for the most up-to-date information. 08.55 Aer Lingus has confirmed all flights from Dublin Airport will be cancelled between 11am and 5pm. It said the customer service team will continue to send text messages to customers on affected flights and passengers should check the airline's website for updates. 07.40 No flights are expected in or out of Belfast International Airport at Aldergrove for most of today. The airport closed at 7am this morning and is not expected to re-open until this evening at the earliest. A small number of early morning flights did get away at George Best Belfast City Airport. 07.36 The problems affecting the Aer Lingus website appear to have been resolved. 07.27 Aer Lingus has cancelled over 60 flights to and from European and UK destinations from early this morning. Ryanair has warned its passengers of possible disruption and cancellation. 07.25 The Aer Lingus website is currently experiening difficulties. 07.24 The IAA will be reviewing the latest information from the Volcanic Advice Centre shortly and will make a statement at 10am. 07.21 Donie Mooney of the IAA says the emissions from the volcano became coarser yesterday afternoon. He said they did not have the necessary information to make a decision on restrictions before midnight. 07.19 No restrictions will apply to Shannon or Galway airports until further notice. 07.16 Cork, Waterford and Kerry airports will not have restrictions imposed before 2pm this afternoon. 07.15 Donegal Airport will be restricted from 8am until further notice. Sligo will be restricted from 9am. 07.10 Restrictions will come into play at Dublin Airport from 11am.